From Athens airport you can reach the port of Rafina in abut 20-25 minutes by taxi (around €35), by bus (around €5) or by private taxi (around €40 -reliable, good English speakers and you’d avoid taxi queues-). The trip from Rafina to Andros is about two hours long with standard ferries, or one hour with Sea Jets. The price is usually around €18-21 (one-way). From Mykonos airport you can reach the port of Tourlos in abut 15-20 minutes by taxi (around €25), by bus (around €4) or by private taxi (around €30 -reliable, good English speakers and you’d avoid taxi queues-). The trip from Mykonos to Andros is about two hours long with standard ferries, or one hour with Sea Jets. The price is usually around €15-18 (one-way). You can consult ferries’ updated schedule and book your tickets from this website. Alternately you can purchase your tickets through the official ferry companies’ websites ( Ex. Golden Star Ferries, Fast Ferries, Sea Jets etc). NB: Make sure to have your pdf ferry ticket vouchers printed out. Keep in mind that when purchasing your tickets online, you will only receive a voucher (not valid as a ticket) that will have to be handed in to one of the ticket offices located near the port in exchange for the official versions. You could purchase your tickets directly from Rafina or Mykonos’ tickets offices located at the entrance of their ports. Keep in mind that during high season periods or weekends, tickets may be sod out. For more information or extra assistance, please contact one of the Ticket offices listed below. There are no public transportations reaching the house, as a matter of fact, renting a car is highly recommended. We also encourage you to rent a 4x4 car, as most roads on the island are not paved, (including Mèlisses’). For more information, have a look at our list of car rentals on the island of Andros. Quads are a good alternative to cars, a more “adventurous” option. For more info contact Mamais moto, located in Gavrio. NB: Please be aware that during Meltemi season, it may be more difficult to drive around the island with a quad, especially for long distances. 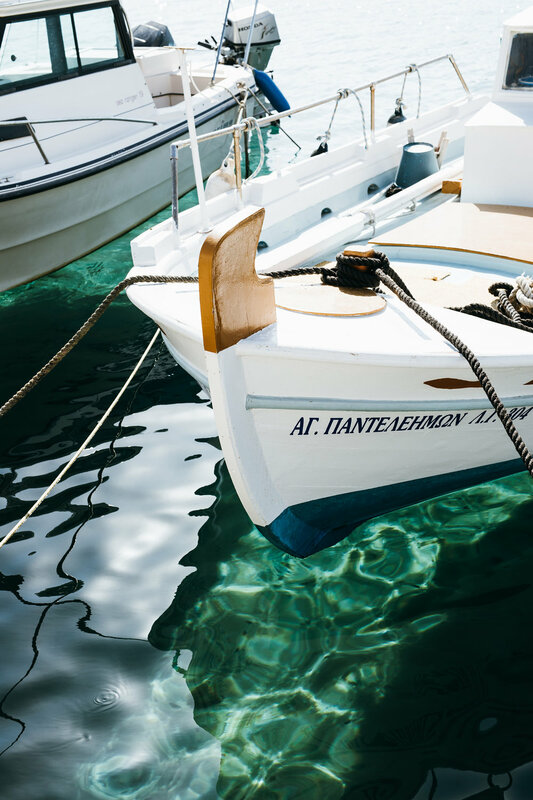 In the port of Xora, there’s the possibility of renting a private boat without licence and visit some of the most beautiful beaches of the island. For more information contact Rent a boat Riva. NB: please be aware that boats will be rented only with optimal weather forecast and stable wind conditions. The property of Mèlisses is located in a really strategic point, halfway near to all main sightseeings. It is situated in the ancient bay of Paleopoli in Aprovato area. There, underwater, you can still see the old city, once the main harbour of the island. The property is just seven minutes away from the village of Batsi, a little harbour where you’ll find nice restaurants and small typical Cycladic shops. 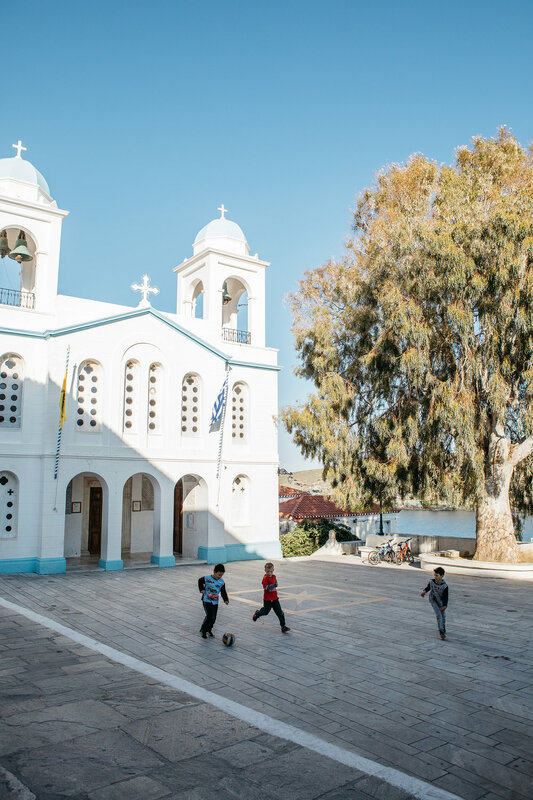 The capital of Andros: Xora, is about 35 minutes away from the house and Gavrion about 20 minutes away. From the house, you can easily drive around the island, discovering isolated wild beaches and water springs. How many guest can the house accommodate ? The house can accommodate up to 14 guests. Do you also rent the whole house ? Is it advisable to rent a car during our stay ? Definitely, please visit our car rental page for more information. Do you allow Animals ? Yes we do, we allow small pets, but they can’t have access to the property’s pools. Is mèlisses child friendly ? We can comfortably host children of all ages and provide everything they may ever need, including baby cribs, high chairs and strollers (we advice booking them well in advance). Parents should always supervise their children, especially around swimming pool areas or walking paths heading to the sea. In which area is the house located ? Mèlisses is located in the area of Aprovato, about 20 minutes away from Gavrio. Do you host private events or Celebrations? When is the best time to come ? Andros is always wonderful! We personally love off season months, such as September, October or even April and May, as the island gets really quiet and beautifully wild. Meltemi is a strong North wind that blows on all Cycladic islands around the month of August and sometimes it can start a bit earlier, in July. Mèlisses is located on one of the most protected areas of the island, not exposed to strong winds. What is included in our stay ? Our daily rate includes breakfast, daily housekeeping and access to all facilities of the house. Is it possible to have private cooking classes or Workshops? Absolutely! For more information please contact us at info@melissesandros.com or visit our workshop page to join one of our group workshops.